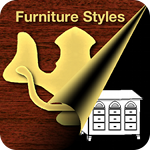 The Connected Furniture Styles software application helps you identify the style of your antique and reproduction furniture through custom furniture profiles that you create. Learn more about the Furniture Styles application’s features. Describes and dates nineteen popular furniture styles and their distinctive components. Each style includes a description of the appearance, ornamentation, proportion, fabric, hardware, finish, wood, and more. A list of sites with woodworking plans, patterns, and projects. The list includes a description of each site and the cost of plans. A collection of links to other useful sites and resources. The links are organized by category and contain a description of the site.